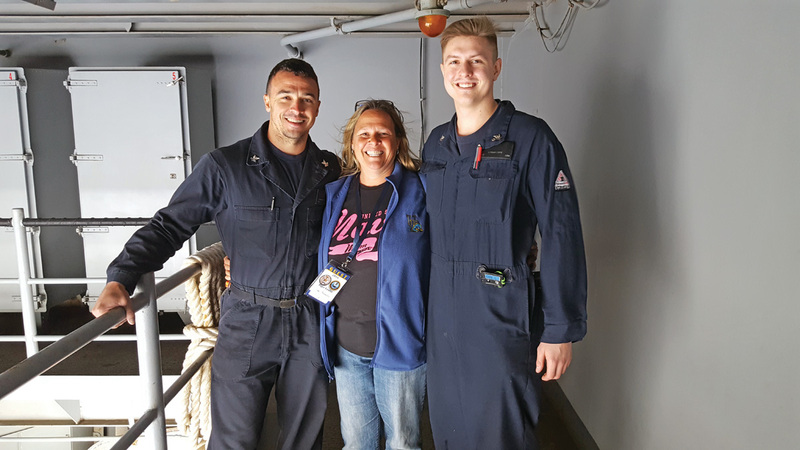 Cameron and Lisa Travalini enjoy time together during her tour of the U.S.S. Theodore Roosevelt. The Travalinis and another crew member on board the Roosevelt. After all, she knew there was always the possibility that the Roosevelt could be called into dangerous duty at any time. Like any mom, she tried to imagine what life was like for her son — her middle child — onboard the carrier. She savored the chances she got to talk to him, especially the occasions he was able contact her by Facetime and she could actually see his face. But it was hard not being able to see for herself where he spent his days — and nights — aboard the ship. She said friends and family questioned her sanity somewhat when she decided to take that trip — because, after all, an aircraft carrier does not have the accommodations of an average cruise. But she was not deterred. “I looked at it as an adventure,” she said. Plus, how could she miss any chance to spend a week with her son? While the cruise, which added about 600 friends and family members to the crew of 5,000, gave Travalini a chance to experience some of Cameron’s life aboard the ship, she couldn’t see where he actually works. Having completed two years of training at the Navy’s Nuclear Power School in Charleston, S.C., last year, he works on the nuclear equipment that runs the ship, which is off-limits to visitors. During the Tiger Cruise, Cameron didn’t have to work, though, so the two spent quite a bit of time together. Given that the carrier, which is 20 stories tall and almost 1,100 feet long, is a small city within itself, there was plenty to do during the week. But Travalini said that, without a doubt, the “most awesome thing” for her was the air show. “It was like the air shows in Ocean City, except much closer to you,” she said. “They put on this fantastic display. They fly the planes off right in front of you. … They drop bombs and shoot guns in the water.” During the show, organizers explain the equipment being used, which Travalini said she found very interesting and educational. “It was all new to me,” Travalini said. She also said she now has a new understanding of what it must be like to be on the ship for months at a time. “There’s really no concept of time on the ship,” she said. The cruise has helped give her a comfort level about Cameron’s safety, she said, and an understanding of life aboard the ship. While he was deployed, Travalini said, it was difficult sometimes, not knowing where he was when she hadn’t had any contact with him in a while. “Tears were shed, trust me,” she said. Now, though, “I see how long and how hard they work, and I know he’s probably just busy working” when he’s out of touch, not necessarily somewhere in the midst of a conflict, Travalini said. The Roosevelt, also known as “The Big Stick,” has been deployed to such places as the Persian Gulf, the Indian Ocean and the Philippines. Although he can’t tell her where he is when the ship is deployed to a location, it is possible to find out after the fact, Travalini said. When he can, he sends her pictures of the “magnificently beautiful” places he sometimes gets to visit while deployed. Another part of the trip Travalini said she found particularly meaningful was meeting the families of other crew members. She heard stories of families being separated during crucial times, she said, that were “heartbreaking.” She met a crew member who was about to meet his 7-month old baby for the first time. “That, to me, was a huge sacrifice,” said the mother of three grown children — Cameron, his brother Cody and sister Whitney. She said there is good support for family members; she finds the Facebook group for families of Roosevelt crew members particularly helpful. Technology has made communication “from ship to home” so much better today that it was years ago, for which Travalini said she is grateful. “I don’t know how they did it with snail-mail,” she said. The time on the ship, “just spending quality time” with the son she calls “my overachiever,” was balm to Travalini’s soul — she said it had been years since she had spent such one-on-one time with him. “Just sitting in the mess hall talking” was a treat, she said. It helps take away the constant worry she feels when she can’t spend time with him. When she’s back home in Millville, she said, “I just pray.” A bus driver for the Indian River School district, Travalini said, “When I get on the bus in the morning, I just pray all the way down. It’s all you can do as a mother,” she said. 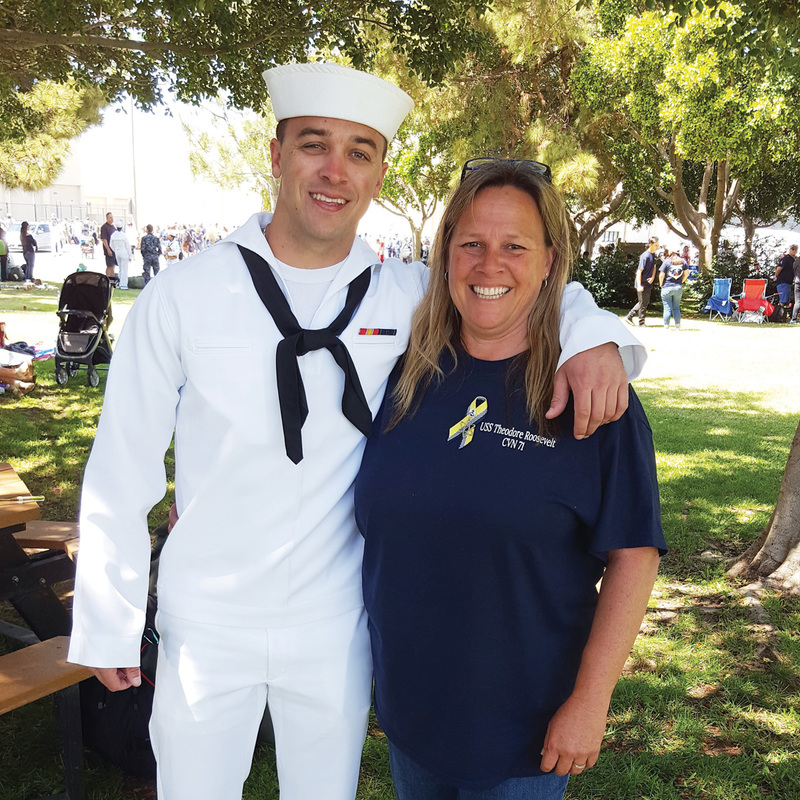 Travalini said she has always been proud of Cameron and all of her children, and that the Tiger Cruise gives her even more pride in her Navy son and his career choice. “It exuberates out of me,” she said.